Road works and rain – the story of my summer. After a nightmare week of flitting around our beautiful county, I am ready to leave the van behind and hitch a trailer to my bike and get out and about spreading the word about Taste the Cracklin. It’s usually the case however that we have a mad week, hectic and stressful, in the lead up to the real work of the Friday, Saturday and Sunday. Administration really is not my strength so this preliminary work is a bit of a chore until I get my hands on the machines and the food – as a “tech-chef” I really enjoy using the new bits of kit we get – it feels like race weekend at Silverstone when Jenson gets his upgraded side pods! Roll on the weekend then and last weekend was a fantastic couple of days. We had a 21st birthday party out in the sticks – usually these are pretty small affairs 20 or 30 family and friends. This one was massive however – about 70 people I think. When we arrived at the address, my Satnav had sent us about 5 miles around in the wrong direction – why does it always seem to choose the private road that you can’t drive down? Eventually we arrived at our correct destination, luckily it was an evening party so we were not pressed for time first thing in the morning, the house was gorgeous, down a rather grand driveway and secluded in the Cotswolds, a pretty heavenly place actually. These are my favourite type of events working with Taste the Cracklin – they are a little bit more intimate and you get to interact with the guests a lot more when it’s a private do. 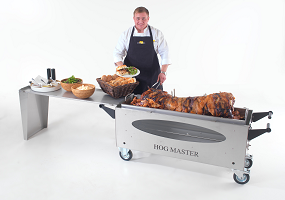 Often I have to set the spit roasted pig up really early in the morning to give it the full 6-7 hours slow cooking time ready for lunch time, but as this was a later party I was able to get things set up and started without a massive rush. It was a good job too as the party was being held in the gardens and this was a long way from where we left the van. One of the really great things about our machines is their manoeuvrability this comes in handy when catering in some of the odder places. This is particularly helpful if you hire a machine from Taste the Cracklin as it gives you peace of mind no matter what type of party you are having. It was certainly useful for the birthday do, as we had plenty of equipment to shift out of the van and to the back of the garden. Once all the food and machinery was out though, it was plain sailing. The pig was on and cooking before most of the family had got out of bed it seemed. Before we knew it however we were helping the family out with some of the decorating and the cups of coffee seemed to be unending. We had an absolute blast – when you get a party like that you don’t feel as though you are working a lot of the time – you end up as part of the event itself. Everyone loved the food – roast pork and all the trimmings, as well as some locally reared chickens – the family chose our full catering package so we had some waiting staff, as well as the chefs and it was a great day. At the end of the night we left the remnants of the pork and cleared away discretely whilst the party went on – apparently, according to a platitude laden email, the party didn’t wind up until about three in the morning so it must have been a good night. Next weekend I have a little break – off to see some family in Scotland – so I may not be able to give an update on our little gang of roasters for a few days. But if you are in need of some hog roasting expertise then there is plenty of help back at the pig roast Tewkesbury office. Any special menu requirements, organising an event or if you want to hire or purchase equipment we have the right person who can help. With Bonfire night just around the corner you may want to have a machine of your own for the night – Taste the Cracklin will help with anything you need. Give our friendly office staff a call and we’ll get you in touch with the right people.